Our annual 2016/17 Client Interviewing Competition, sponsored by Gerard Maye Solicitors, was another great success! Following last year’s success where our Law undergraduate students, Chloe Chatton and Fi Richardson, came third in the world – this year’s regional winners will now move on to compete in the national competition – this year held in Kent. Well done to everyone who took apart, and congratulations Jack Boyle and Charlotte Ludlam for making it to this year’s final, and we wish Ashley Concannon and Lizzie Mutter, both postgraduate Law CPE students, all the best for their approaching competition! You can read more about the competition from Marlon Cameron and Jack Boyle, two Law students, on the Law Network blog. 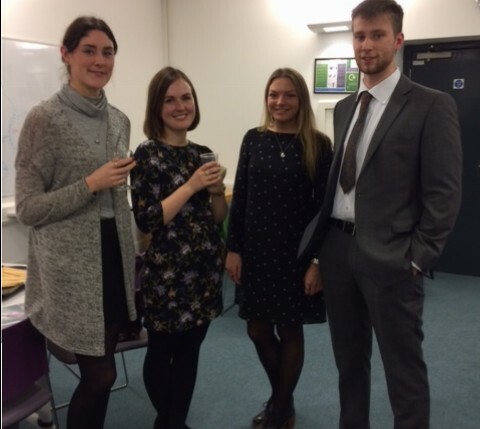 Client Interviewing finalists, from left to right, Charlotte Ludlam, Lizzie Mutter, Ashley Concannon and Jack Boyle.